Now there are some amazing Toy Story High Top Sneakers that are bold and amazing looking. These Toy Story shoes come in many sizes going from 6.5 – 9. The shoes are different and clearly not for people that do not want their shoes to take attention because these shoes scream for attention. 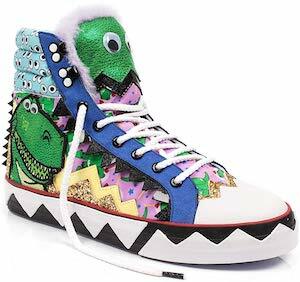 On the side of the shoes you can see the face of Rex the green dinosaur from the Toy Story movies and on the from you can even see its eyes and there are way more eyes all over these shoes. And besides Rex there are way more bright details you have see up close so click on the picture to see them. If you like your child to look fun and be protected then you should get them this Finding Nemo Bicycle Helmet. The people from Bell always seem to make the most adorable helmets that are also safe and great at protecting the head of children and adults. This helmet looks like Nemo the famous orange clownfish complete with little fins on the top and side. 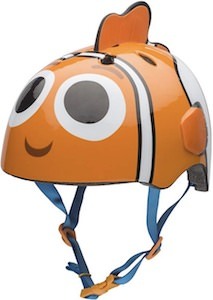 You can get this helmet in two sizes so that kids ages 3 – 8 can enjoy being Nemo while riding their bikes, scooters, or maybe rollerblades. So get the bicycle ready and adjust the helmet for the perfect fit. 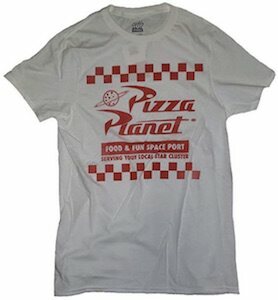 Now there is a shirt for pizza and Toy Story fans because this is a Pizza Planet T-Shirt. This Toy Story t-shirt is white and made from 100% cotton and is available in men’s sizes Small – 4XL and will look great on women too. 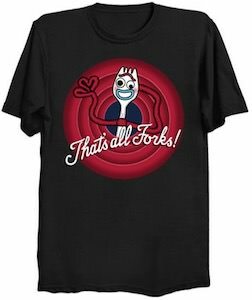 It is just a fun shirt that only people that know Toy Story would understand but still people will understand the Pizza part because who doesn’t know pizza. 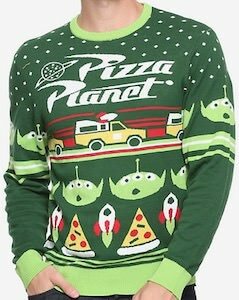 If you like Toy Story and Pizza then you should check out this Toy Story Pizza Planet Christmas Sweater. 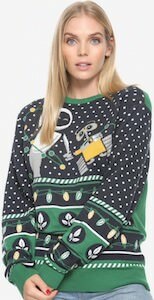 The Toy Story Christmas sweater is unisex making it great for both men and women and you can get the holiday sweater in sizes XSmall – 2XL and they are made from 55% cotton and 45% acrylic. The sweater is green with on it the text “Pizza Planet” on top and then there are many details like space ships, aliens, and slices of pizza. And this sweater is not festive so you could just wear it all winter long. If you like Toy Story and want a fun outfit then you want to check out this Alien Onesie Pajama. The women’s Aliens costume comes in sizes XSmall – 3XL and has a big zipper on the front to making easy to wear. We all know that Aliens from the Pizza planet are light blue with a green head and the onesie has the same colors. On the blue onesie you can see a planet and a belt all part of the outfit and the green hood has the face of the Alien on it with all it’s big eyes. Now you can lounge at home or use it as a cosplay or Halloween outfit. Now there is a cool Pixar Toy Story wall clock that is like a cuckoo clock only without a bird. The Toy Story cuckoo clock is 1 1/2 feet tall and shows an amazing amount of characters from the Pixar movie and instead of a bird every hour the doors open and Hamm the pig shows up and music will play. Three are some amazing details on this wall clock from the little green army men on top and a pizza planet pendulum with weights next to it that are weights that look like the green aliens and a rocket. This wall clock is amazing and super fun and will be loved by everyone that love Toy Story or just classic cartoons. Monsters Inc. , Monsters University both fun movies with great loveable characters. If you love the adorable little one eyed green monster called Mike Wazowski then this dress is perfect. On the Monsters Inc. Dress you see the feature characters face of Mike Wazowski, one large eye on the front chest are with a big open mouth underneath the eye. The rest of the dress is green the color that Mike is in all the movies. This Monsters Inc. dress is an A-Line dress which is a looses fitting dress that has a great unique easy looking flow for maximum comfort and style. 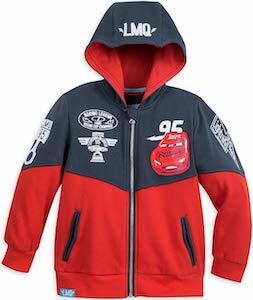 It is available in a wide selection of women’s sizes that will range from XS to 2XL. You can throw this dress on for anytime or even wear it as an easy but great Halloween costume.